Dance Commentary by Heather Desaulniers: "Angles of Enchantment"
With their newest evening-length work, Garrett + Moulton Productions have restored my faith in avant-garde, experimental, interdisciplinary, contemporary choreography. “Angles of Enchantment” has all the necessary components of noteworthy modern dance: form, structure, narrative, concept, collaboration and technique. Whimsy and humor also played an ample role in “Angles of Enchantment”, but its use always made absolute sense. There was no ‘movement for movement’s sake’ nor dance-making steeped in the ridiculously absurd. This was real; this is what San Francisco modern dance should aspire to. As the piece began, we were introduced to the entire company (dancers Tanya Bello, Carolina Czechowska, Tegan Schwab and Nol Simonse) through short image vignettes, captured in different sized spotlights all over the stage. Organized as solos, duets, trios and quartets, these were like preparatory remarks; a physical manifestation of preliminary phrases, words and ideas. Following this gorgeous prelude, the cast moved onto its first main group sequence, journeying through an imaginary forest, complete with a scattered, shadowy light pattern and fluttery, fairy-like choreographic batterie. These opening moments set up the formal structure that would continue throughout the seventy-minute piece: short, individual scenes that examined and spoke to the same concept. Narratively, “Angles of Enchantment” was all about the path of discovery one makes using their imagination. About a third of the way through the dance, Simonse had a solo that was clearly about learning to let go and forgive. Later, the three women performed a divertissement that revealed a trio of wonderfully hopped-up, disco-style Swan Lake cygnets. 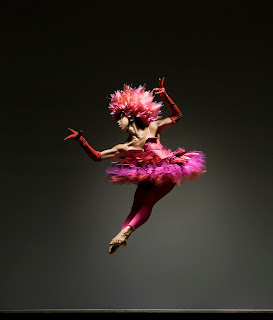 Combining turned out pas de chats with flexed attitude relevés illustrated the importance of experimentation – taking perhaps one of the most famous ballet variations and flipping it one hundred and eighty degrees. Czechowska spent another entire section in a giant tree costume with a huge headpiece and Southern Belle-style hoop skirt. As she traveled slowly, calmly and quietly along a diagonal line, a comment on humanity was abundantly clear: we are more the same than we are different. Janice Garrett and Charles Moulton’s conceptual foundation of discovery through imagination was pure, relatable, universal and consistent. Garrett and Moulton have a rich history of successful choreographic collaboration so it would stand to reason that they would seek out equally brilliant design and music collaborators. Both Audrey Wright’s lighting design and Margaret Hatcher’s costumes were inspired. But, the music was really something else. Composer and performer Peter Whitehead was a one-man band, who literally had a treasure chest of instruments on his raised platform downstage right. Combining string, percussion and voice, Whitehead was not accompanying the dance performance. His role as the fifth performer was apparent in the entire work, but most pointedly in the two scenes where one of the women sat with him to learn how to play some of the instruments (again, a reference back to the narrative). Technically, Bello, Czechowska, Schwab and Simonse were very well matched. They are certainly different dancers (no cookie cutter corps here), but their performance experience and modern dance acumen was clearly on par with each other. My only technical quibble was with the turns. Each of them had a habit of ‘winding up’ prior to many of their turns, both in their torsos and with their arms. It almost gives away the turn when dancers do that. And from a choreographic standpoint, I loved almost the whole piece, except for the long tag at the end. About five minutes before the final blackout, there was a return to the short choreographic snippets in numerous pools of light. Because “Angles of Enchantment” began this way, it would have made more sense to end the piece there. The recapitulation of that first idea was much stronger than the extended coda.